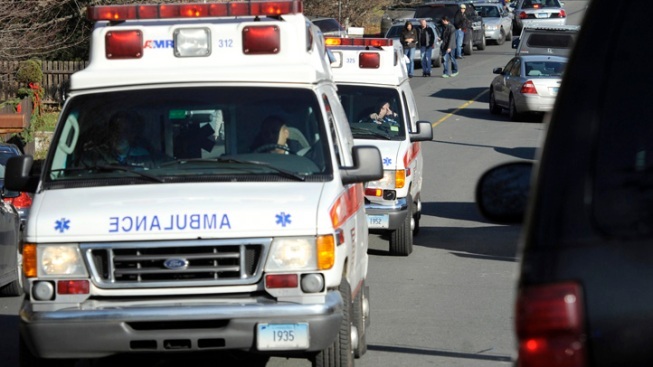 Ambulances leave an area near the scene of a shooting at the Sandy Hook Elementary School in Newtown, Conn.
With bursts of gunfire ringing out in the hallway, Kaitlin Roig, a teacher at Sandy Hook Elementary School, huddled in a cramped bathroom with her 15 first-grade students, trying to assure them that everything would be alright -- even though she didn't believe it. "I'm thinking, 'We're next,'" Roig told ABC News' Diane Sawyer in an emotional interview. "And I'm thinking, as a 6-year-old, 7-year-old, what are your thoughts? I'm thinking I almost have to be their parent. "So I said to them, I need you to know that I love you all very much, and it's going to be OK, because I thought that was the last thing they were ever going to hear. I thought they were all going to die. I wanted them to know someone loved them, and I wanted that to be one of the last things they heard, not gunfire in the hallway." Moments earlier, when a gunman identified to NBC News as 20-year-old Adam Lanza forced his way into Sandy Hook Elementary School in Newtown and began his shooting spree, killing 20 children and six adults, Roig rushed her students from the classroom to a bathroom, then barricaded the door with a bookshelf. She was eventually rescued by police. Roig's story is one of a handful of heroism amid tragedy that are sure to emerge over the coming days. Several of the victims died trying to save lives, according to reports. The school's principal, Dawn Hochsprung, and school psychologist Mary Sherlach were in a meeting with a parent, other staff members and school therapist Diane Day when the shooting started, Day told The Wall Street Journal. While most people dove under desks, Hochsprung and Sherlach rushed to see if they could help and ran toward the shooter, Supt. Janet Robinson said. "They didn't think twice about confronting or seeing what was going on," Day told the Journal. 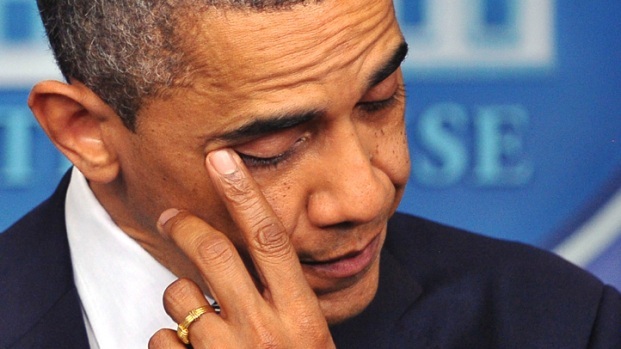 "Our hearts are broken today," President Barack Obama said in reaction to the elementary school massacre in Connecticut. Another teacher pressed her body against to door to keep Lanza out -- and was shot twice in the process, Day said. "She was our hero," Day told the Journal. Bill Vollmer said he considers his wife, Janet, a kindergarten teacher, a hero. She was not injured, but is devastated, he said. "This is a Community, Not Just a Town"
"She locked the doors, pulled the blinds, put paper over the window on the door and sat the kids in a cubby and read to them and tried to distract them from what was really happening," Bill Volmer said. One teacher helped students get out through a window, Robinson said, and one hid the students in the kiln room as the shooter made his way through the school. "The teachers were really, really focused on saving the students," Robinson.